The key to this roast is to thoroughly smear your boneless leg of lamb with a garlic salt paste a day ahead of time. Prepare the paste by putting a whole head of peeled garlic and two tablespoons of kosher salt in the food processor or mince the garlic by hand then combine with the salt. 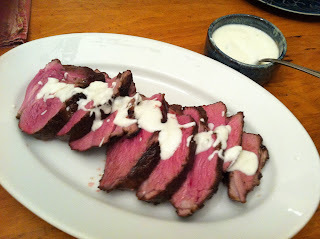 After rubbing it into the lamb wrap tightly with saran and refrigerate overnight. The yogurt sauce is also best made ahead of time by stirring together a cup of plain yogurt, two tablespoons of tahini, the juice from half a lemon and salt and pepper to taste. The following day simply roast the lamb for about an hour at 350 for an internal temperature of 120 and serve with the yogurt sauce.